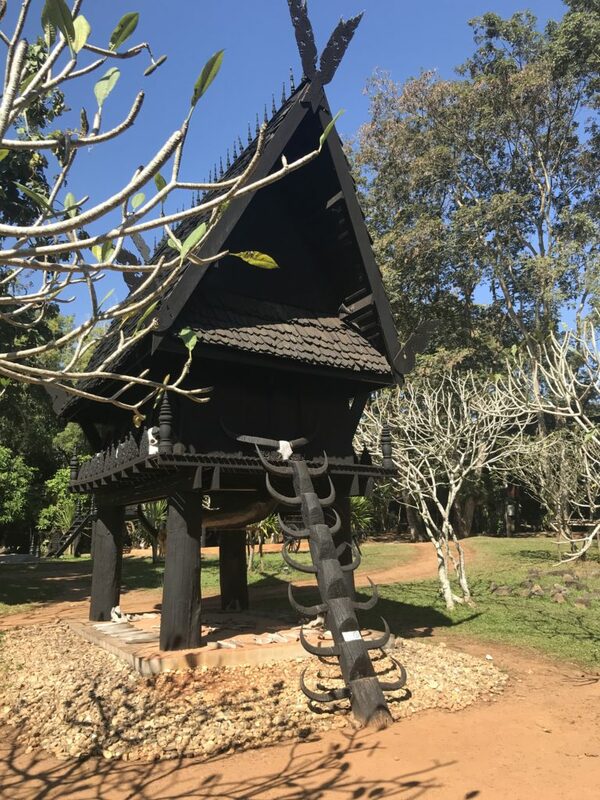 The macabre Black House (Baan Dam) is generally seen as an essential part of any Chiang Rai trip. I have to say, I couldn’t get over the horror of it. Yes, it’s art. Yes, it’s very impressive. Yes, the architecture is fantastic. However, even now when I look back over photos of it, it makes me shiver. 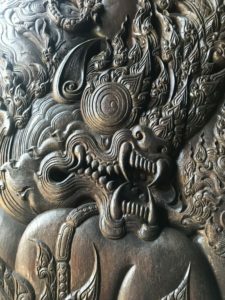 Thanwan Duchanee, the artist who built it, was a collector of animal parts. I could just about get over that for the sake of art. But by the end, it was a bit much. Baan Dam Chiang Rai was the home and workshop of late artist Thawan Duchanee (d. 2014). The entire area feels like a piece of art. Every structure is unique and contains examples of his unique (and creepy) work. 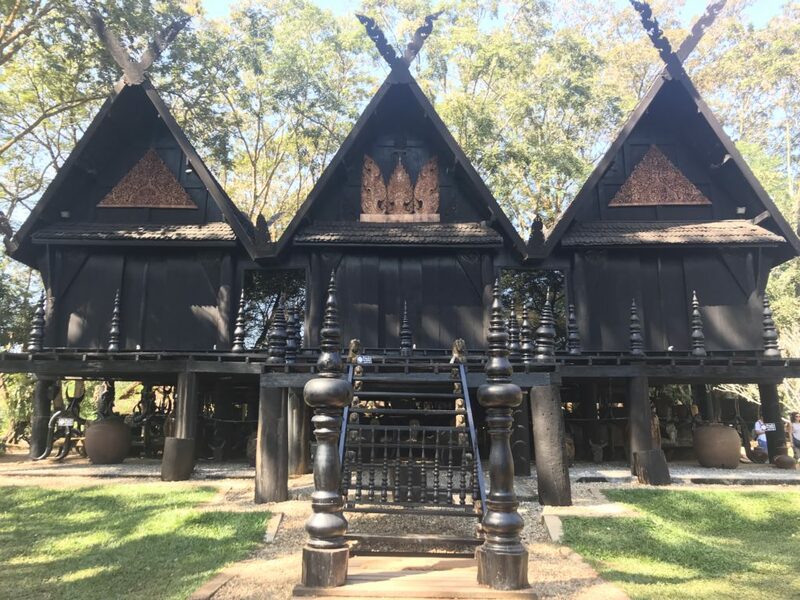 The black museum Chiang Rai complex consists of a large grassy area with around 15 separate buildings. 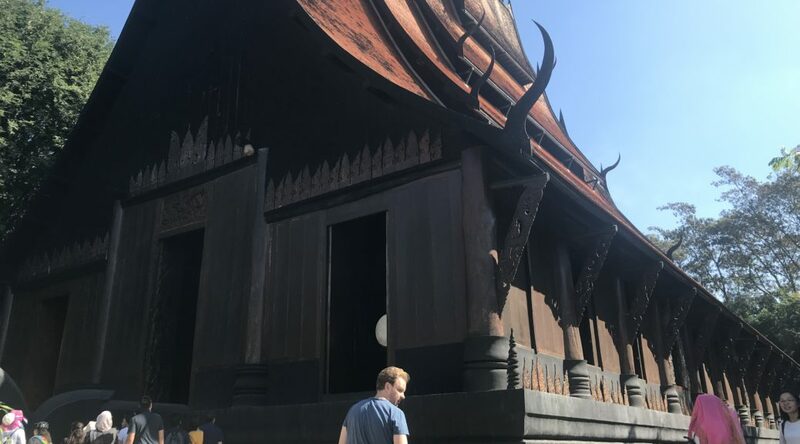 The buildings resemble black temples – Thawan Duchanee’s iconic style. 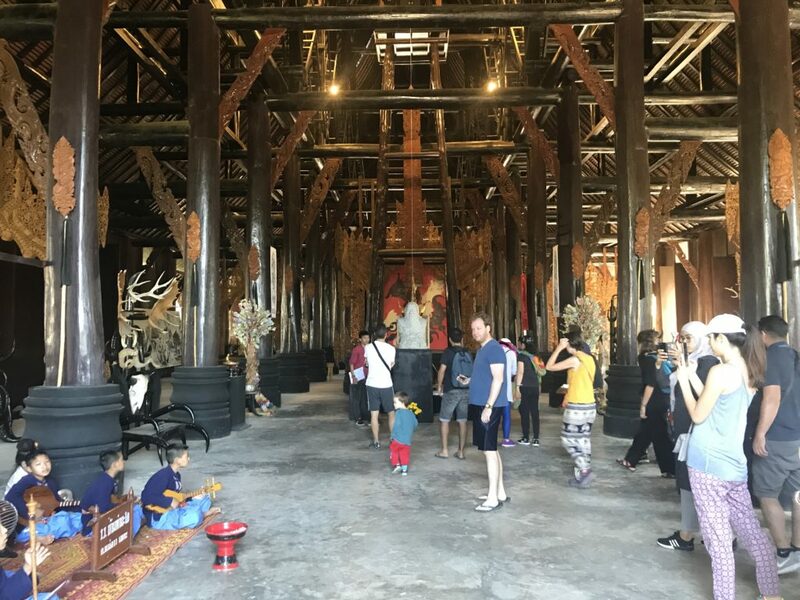 You’ll hear this referred to as the ‘Black Temple Chiang Rai’ but it’s not a religious area – it just looks like one. The first thing you see when you enter the black house museum is the huge ‘Black Temple’. 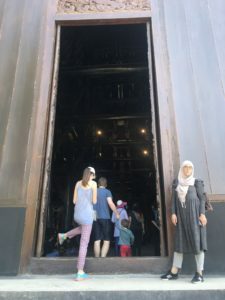 We entered through the giant, carved doors, completely covered in exquisitely detailed monsters. Very cool. The building itself is certainly impressive and interesting. Everything’s built in dark, rich wood. Looking up, you can see the beams of the roof. And as you walk around you’ll see carved statues as well as the collections of animal skins and art. There are children sitting on the floor playing instruments. I’ve seen other reviewers show outrage at this. From what I saw they looked bored, but I couldn’t see any signs of obvious mistreatment. 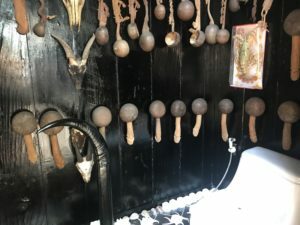 Inside the Black house you can see some of Thawan Duchanee’s collection. It was this that really made me uneasy. I knew about the animal skins beforehand, but the sheer volume of the collection is quite staggering. I don’t want to have to think about how many animals died to create it. The presentation is certainly excellent. 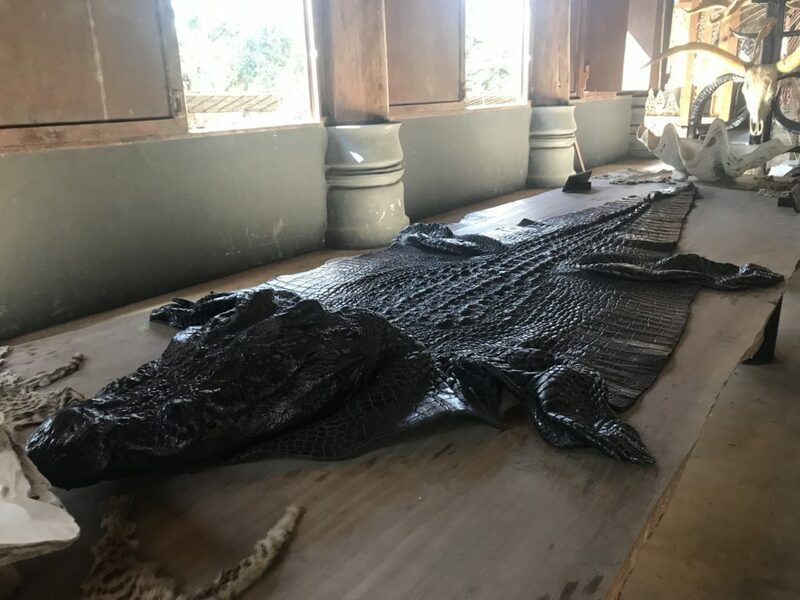 The crocodile skins in particular were well preserved and displayed. Its quite a mix of horrible and impressive. In terms of Chiang Rai things to do, it certainly stands out! We walked outside to visit the rest of the complex, where ther many similar buildings filled with Duchanee’s art. We particularly liked his treehouse, complete with antler steps. I’ll admit, this was quite cool! And his outhouse with phallic carved wash buckets (of course). There are also rooms full of antler chairs, which seems to be a speciality of his (they were everywhere). 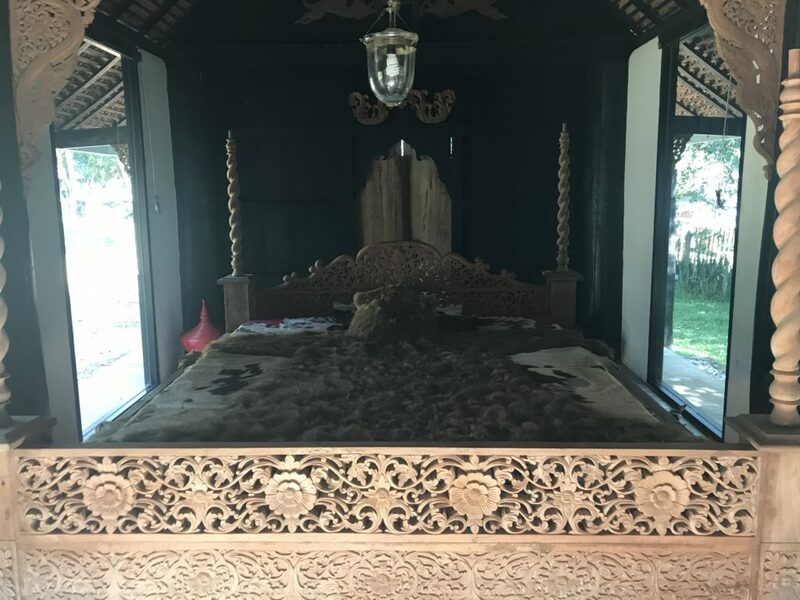 It was the crocodile skin room that really put the nail in the coffin for me, though. 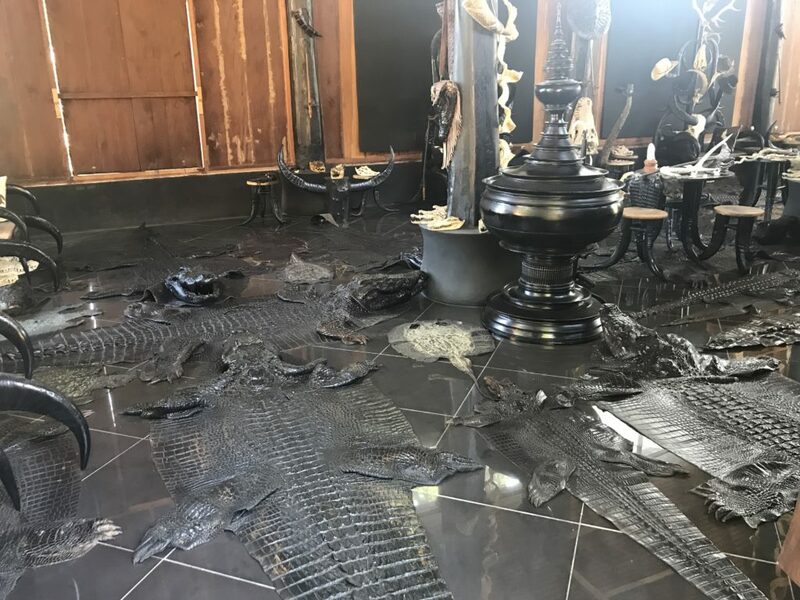 The floor is almost entirely covered in crocodile skins of different sizes. It really was sickening. It felt like more of a fetish than art. Then finally, you can see his bed, covered in a bear skin. I’m glad I saw it, although like other reviewers, I was horrified by the end. My kids are both under 3, so didn’t really understand it. I’m not sure that I would have wanted to take older kids to see this. It’s a shame because the complex is quite a pleasant place to be. The buildings are nestled in between grass and trees. The contrast between nature and the dark wood was really beautiful. Shame about what was inside them. Baan Dam location: You can easily drive to it (it’s about half an hour from Chiang Rai city). Or look out for a ‘Chaing Rai black and white tour’. 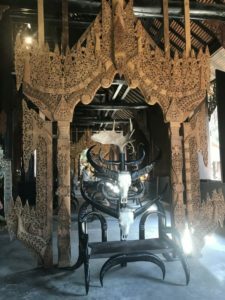 These take you to the White Temple Chiang Rai, the Black House and other Chiang Rai attractions. Food and drink: There were a couple of stalls selling coconuts, fruit and soft drinks on the far side of the complex. There’s also a museum shop and restaraunt outside of the main area, near the car park. Parking: There’s a big car park just next to the entrance. Be prepared to fight for a space, though as it was packed!